If you have to see it to believe it, then you won't believe the micro fiber on the TM. Unlike any reel for magicians! 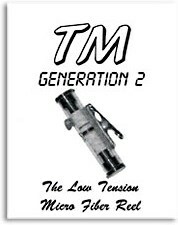 The TM is very small and operates at low-tension. In fact it is almost like doing thread work without a reel, yet it takes up slack or delivers more line. Each reel has over forty-five feet of ultra-thin fiber. If you use thread up close and you don't want it seen, then you must have the Thread Manager! The Thread Manager has been circulating the elite since early 1992. Engineered by Mark Allen for his close-up work. Generation II makes the case more slender and the cartridge easier to change. The perfect match for many close-up and parlor effects. Micro fiber, for in your face thread work. Low tension, so you can work with the micro fiber freely. Miniature design with up-to twelve feet of working line. Adjustable tension by simply turning the end caps. Convenient alligator clip to clip it anywhere.